Now that the interior of the new building is mostly finished, the crew is working on the exterior of the building until they can begin the second phase of the project which is the kitchen renovation. The wall of glass doors is our Community Room, and we have two doors leading outside to what will be a patio space. The patio will give us extra space for hosting celebratory and fundraising events in our multi-purpose Community Room. 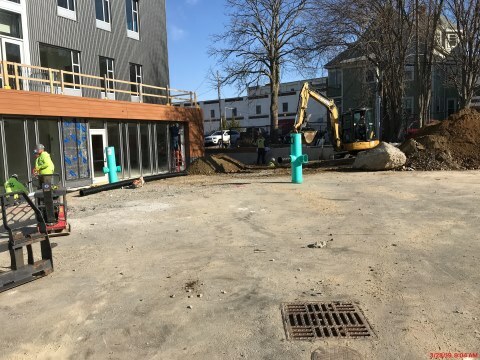 Since the Community Room will also be where staff and volunteers enjoy lunch together, the patio will offer some outdoor dining space in the warmer spring and summer months.